The Whangara Maori Tribe of the east coast of New Zealand’s north island believe they are descended from a single ancestor, Paikea the legendary Whale Rider over a thousand years ago. Paikea escaped drowning after his canoe capsized by riding to the shore on the back of a whale. 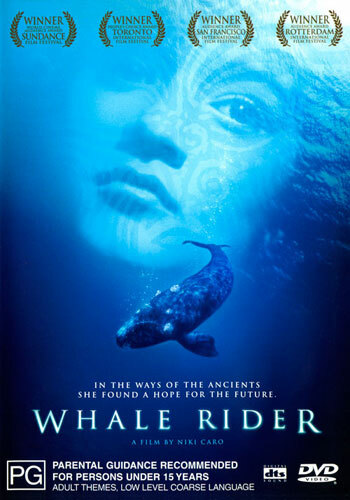 The movie Whale Rider is based on the much loved 1987 fictional book of the same name by Witi Ihimaera. It is set in the present day and follows Pai, the 11-year-old girl granddaughter of the Whangara Chief, Koro. In every generation for a thousand years since Paikea a male heir has inherited the title of chief. But now there is no male heir and Koro is desperate to find one as successor. Pai is his only grandchild and as a female is not able to inherit as is Maori tradition. Pai believes she is destined to be the next leader, but to become leader she must defy Koro, someone she deeply loves and respects. Koro is bound and blinded by a thousand years of tradition to pick a male leader. The movie follows their journey of conflict, love, tradition and destiny.